This is the basics about Chatham Islands. Originally it is published by Chatham Islands County Council. Last update: 27th Feb 1998. The Chatham Islands, a group of ten Islands are part of New Zealand but are separated by nearly 700 km of sea from any other inhabited land. They form one of New Zealand's smaller counties, both in area and population. They have importance because of their Rock Lobster and Paua Industry and interest through the richness of their bird life. Their former comparative isolation has been overcome by the introduction of a regular air service. It is generally agreed that the original inhabitants of the Chathams were the Morioris who arrived on the Chathams some time between 950 AD and 1150 AD. The Islands were first discovered by Europeans on the 29th November 1791 when Lieutnant Broughton in the HM Brig "Chatham" landed and took possession. The Moriori population at the time was estimated at 2000. From 1793 onwards the South Pacific was invaded by Whaling and Sealing fleets from Europe and North America and the Chathams became a centre of this unregulated industry. Ten islands all within a radius of 40 kms. Only the two largest are inhabited. From Wellington 417 nautical miles, from Christchurch 467 nautical miles. Much maligned. Moderate climate with an average temperature about the same as that of Christchurch and an average rainfalla about the same as that of Nelson. Chengeable, windy, and rarely frosts. Some 40 percent of Moriori/Maori decent. The balance predominantly European. Other Settlemets: Owenga, Fishing, farming Settlement, Te One, Largest school and Marae, Kaingaroa, Fishing settlement, Port Hutt, Fishing settlements. Form part of the Lyttelton and Western Maori electorates. Time Chatham Islands time is 45 minutes ahead of mainland New Zealand time. The Islanders refer to the mainland as "New Zealand". There are about 60 fishing vessels operating in the Chathams, who land fish into the Fish Processing Factories at Port Hutt, Waitangi, Kaingaroa and Owenga. Crayfish, wetfish, kina and scallops are processed and exported. The fish is either flow to New Zealand or shipped. There are about 60 farmers including part time farmers on the Chathams and 7 farmers on Pitt Island. MOst farmers run sheep and some cattle. THe sheep and cattle are now being shipped to New Zealand for export. Wool is also shipped to New Zealand and sold by various wool brokers. The wildlife on the Chathams is of great interest because of the number and variety of birds found there, even though these have declined since the Islands were colonised and farming developed. Eighteen species of birds are unique to the Islands, where numerous species of common birds are also found. The Chathams are home to the rarest bird in the world, the Parea/Pigeon and also have the largest quantity of the most rarest birds. All but a few of the antive birds on the Islands are protected. Mallard and Grey Ducks, Pukekos, Wekas and Black Swan may be hunted subject to local regulations. South East Island, an off-lying Island is the home of the rare and famed Black Robin. The Black Robin population now stands at approximately 130. The shipping service is operated by Cook Island National Line between Auckland-Napier-Chatham Islands approximately once a month. The service also carries up to 3 passengers. Mount Cook Airlines operate between Christchurch-Chathams and Wellington-Chathams several times weekly. The service carries 30 passengers, mail and freight. Air Transport (Chatham Islands) Ltd - A locally owned and operated service which operates between Chathams - Wellington five times a week, Chathams - Napier twice weekly and Chathams - Christchurch twice a week. Air Chathams (as it is known locally) also flies to Pitt Island when the weather permits. A medical centre with a four bed hospital facility situated at Waitangi, is staffed by a Doctor, Nursing Sisters (Missionary Sisters of the Society of Mary) and local staff. Full Public Health Care is carried out by health service staff with urgent cases flown to Hawkes Bay or Wellington. Health Care Hawkes Bay serves the Chathams. There is a St Jhns Ambulance in operation with trained Volunteers on duty 24 hours a day. There is one Police Constable on the Chathams and residence and station are based in Waitangi. Court sittings are conducted by a visiting District Court Judge at about 6 monthly intervals. Legal and surveying services are provided by visiting professionals. There are at least two qualified Accountants permanently based on the Chathams. A very active Kohanga Reao is situated in Waitangi. There are Playcentre Groups at Owenga and Te One. And a Play Group at Kaingaroa. Most secondary students attend boarding Schools on the mainland and a few remain on the Island and complete their education by correspondence. High School children are flown home to the Islands on the mainland and a few remain on the Island and complete their education by correspondence. High School children are flown home to the Islands each school holidays, airfares being paid by the Ministry of Education for those children whose families are permanent residents on the Islands. Adult Community Education courses are also available at Te One School. Adult Correspondence course are also popular on the Island and prospectuses for many institues can be obtained from the Community Office. Four small churches - Waitangi, Owenga, Te One and Pitt Island. There is a resident Anglican Vicar, a Catholic Priest and Christian Fellowship MInister. The Anglican, Chatham Islands Christian Fellowship, Ratana and Roman Catholic denominations are well established. The ANZ Bank has recently opened a brach in Waitangi and is the only bank on the Island, it is also the pick up and drop off point for mail as there is no Post Office. There is one main Store situated in Waitangi. A small gift/video shop at Te One. A small vegetable shop and a small Cafe also situated in Waitangi. The main store sells petrol and diesel and there is also a petrol and diesel station. Thre is a repair garage which also has a car hire service. Black Robin Rentals also hires out vehicles. 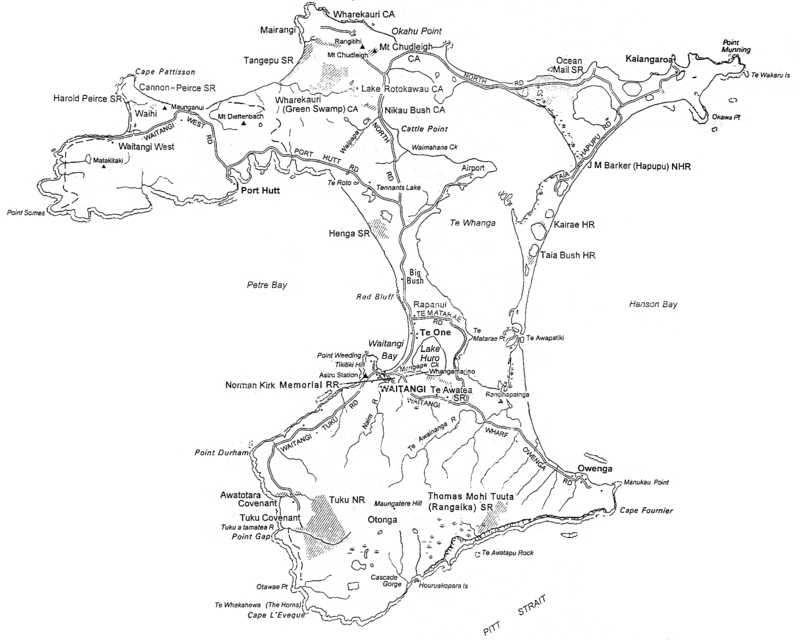 The Chatham Islands has its own FM station called "Radio Weka", which is run by a group of volunteers. Radio Weka also partially comes under the umbrella of the Television Society which is also operated by volunteers. Most radio stations on the mainland can be picked up by the use of an outside areal. The public television service started in May 1991 and the programmes are recorded on video on the mainland and sent to the Chathams. It is one channel service and each night the news is broadcasted live from New Zealand. Sometimes live sport is also viewed. This is operated by local volunteers. Videos have been popular for some years. The Chatham Islands Telephone service is connected to all parts of New Zealand and the world by satellite. Slight delay in acquiring the the required number and when speaking are expected. The Island has a great range of activities, clubs and groups. Weaving, Carving, Canework, Macrame, Leatherwork, General Arts, Spinning, Woodwork, Horse Riding, Tramping, Hunting, Surf Casting, Diving, Bowls, Squash, Darts, Gun, Pistol, Jockey, Tennis, Netball, Rugby, Golf, Pony, Social, Golden Oldies, St John's and more. A community Library, Swimming Pool are situated at Te one. There is a Scout Group which consists of both boys and girls (the Chathams being the first in New Zealand to have both boys and girls as members). There is also a smalla but active Loan Guide Group. A community Office is established in the Council Building and offers a wide range of services. The office is staffed by a full time Community Worker and a part time Administration Officer. Hotel Chathams - On the seafront in Waitangi. This is also the local "pub". Good accommodation. COntact Val Croon on 3050048 for more information. Tuanui Motels - Good accommodation situated approximately 5 minutes wlak from the ANZ Bank in Waitangi. Meals can be obtained upon request. Contact Evelyn Tuanui on 3050352 for more information. Roo's Roost - Backpackers hostel, cheapest accommodation in Chathams. Ask Rhonda. There are many places and things to see, Basalt Columns, Moriori Caves (Dendroglyphs-Tree and Petroglyphs-Rock), Historic Buildings, Blow Hole, Reserves, Seal Colony, a Museum and a lot more. There are also many things to do, you can collect Fossilised Sharks Teeth, take Fishing Trips and Scenic Flights, go Scuba Diving and Hunting. (Wekas, pigs, wild shep) The list is endless. (But it ends here). It should be noted that there is no public transport service on the Islands. Take-away meals can be obtained from Petre Bay Takeaways in Waitangi, the Pie Cart in Kaingaroa and also C.J Cafe in Waitangi. All though there are no Salons here, there are Hairdressers on the Island. The Chathams are a group of islands lying approximately 800 km east of New Zealand. Two islands, Chatham and Pitt, are inhabited but numerous other rocky islands also provide fishing grounds and nature reserves. The main island consists of volcanic outcrops with extensive peat beds and consolidated sand dunes. Pitt Island is more undulating. The total area of Chathams is 90045 hectares with approximately 20000 hectares of lakes. Pitt Islands has an area of 6070 hectares. Rapid weather changes are a feature of the Chatham Islands, rainfall is moderate and extremes of temperature are rare. Fishing and agriculture are the predominant industries. The population is relatively young in comparison with New Zealand centres. Over 300 people live in and around the main centre, Waitangi. Centres with populations of over 70 include Kaingaroa, Owenga and Te One. Approximately 50 people live on Pitt Island.